Along with teaching some of the top rock guitar players of the ’80s and ’90s, Joe Satriani is one of the most technically accomplished and widely respected guitarists to emerge in recent times. Born on July 15, 1956, in Westbury, NY, and raised in the nearby town of Carle Place, Satriani — inspired by guitar legend Jimi Hendrix — picked up the guitar at the age of 14 (although he was initially more interested in the drums). Quickly learning the instrument, Satriani began teaching guitar to others and found a kindred spirit in one of his students, Steve Vai. By the late ’70s, however, Satriani had relocated to Berkeley, CA. With his sights set on his own musical career, “Satch” kept teaching others, including such future rock notables as Kirk Hammett (Metallica), Larry LaLonde (Primus), David Bryson (Counting Crows), and jazz fusion player Charlie Hunter. In the early ’80s, Satriani got a gig playing guitar with power popster Greg Kihn, doing some session work and touring with the group (an archival release recorded around this time, King Biscuit Flower Hour, was later issued in 1996), and issuing his own solo self-titled EP in 1984, financing and releasing the project entirely on his own. But when Vai hit the big time as the guitarist of David Lee Roth’s solo band in 1986, he offered praise for his good friend and former teacher in several major guitar publications, leading to widespread interest in Satriani’s playing. The timing couldn’t have been more perfect for Satch, as he’d just issued his first full-length solo album, Not of This Earth, which automatically made ripples in the rock guitar community. But the best was still to come, in the form of his sophomore release, 1987′s Surfing with the Alien. Almost overnight, Satriani was widely regarded as one of rock’s top guitarists, as the album earned gold certification and the guitarist would finish at the top of guitar magazine polls for years afterward. He was even handpicked by Mick Jagger to accompany the famous singer on a tour of Australia and Japan around this time. A stopgap EP, Dreaming #11, combed both studio and live tracks and was issued a year later, and in 1989, Satriani issued his third solo full-length, Flying in a Blue Dream. Another sizeable hit, the album also marked Satch’s debut as a vocalist on several tracks. His career received another big push the same year when his song “One Big Rush” was included on the soundtrack to Cameron Crowe’s hit movie Say Anything. The ’90s began with Satriani creating his own line of guitars for the Ibanez company (the JS Joe Satriani model), but it wasn’t until 1992 that he would issue his next solo release, The Extremist. The double-disc set Time Machine followed a year later (a combination of new tracks, live material, and the long out-of-print Joe Satriani EP from 1984), and in 1994, Satch filled in on tour for the departed Ritchie Blackmore for heavy metal pioneers Deep Purple. 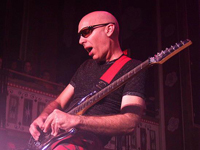 Although he was asked to become a full-time member, Satriani turned down the offer to return to his solo career.